We will be met on arrival and transferred to our hotel. In the afternoon we will explore locally, seeing the first Indian birds of our tour. We will spend two nights at our coastal hotel in the Baga area. 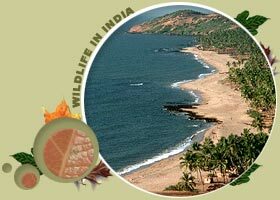 Besides birding in the morning, we will visit the picturesque Portuguese town of Old Goa. This early morning we will drive inland to Backwoods Camp where we stay for two nights. We will return to the camp for lunch after a birding at the forest reserve of Bondla. In the evening, we will visit Tamdi Surla Temple in search of Jungle Nightjar. We will spend the entire day birding around the forests surrounding the camp and other forest reserves. We will bird around the camp before driving to the airport to connect our afternoon flight to Mumbai. We will be met on arrival in Mumbai and transferred to our hotel for overnight stay. This morning we will transfer to the airport in time to connect our flight to Nagpur. On arrival in Nagpur, we will drive to Pench Tiger Reserve (92 kilometres; 3-hour drive). We will check into our resort for two nights. Later in the afternoon we will have our first safari to the core area of Pench National Park. We will take our morning and evening safaris to the core area of the Pench National Park in open topped jeeps. We will have the opportunity to take a last safari in the park before driving to Kanha. On arrival in Kanha, we will check into our resort for two nights. Later in the afternoon we will enjoy the safari to the core area of Kanha National Park. We will take our morning and evening safaris to the core area of the Kanha National Park in open topped jeeps. We will drive to Jabalpur (162 kilometres; 4½ hours) in time to board the overnight train to Delhi. Arriving in Delhi early in the morning, we will transfer to our hotel to freshen up and relax. We have the entire day at our disposal for an optional sightseeing tour of Delhi. We can alternatively go for a birding around River Yamuna. Later in the evening we will transfer to the airport in time to connect our flight to onward destination.